The working of his thought is thus concerned with that slow transformation of the notion of space which, beginning as a vacuum chamber, as an isotropic volume, gradually became a system inseparable from the matter it contains and from time. My eye, tuning towards the imaginary, will go to any wavelengths for its sights. THERE IS A METAPHOR recurrent in contemporary discourse on the nature of consciousness: that of cinema. And there are cinematic works which present themselves as analogues of consciousness in its constitutive and reflexive modes, as though inquiry into the nature and processes of experience had found in this century’s art form, a striking, a uniquely direct presentational mode. The illusionism of the new, temporal art reflects and occasions reflection upon, the conditions of knowledge; it facilitates a critical focus upon the immediacy of experience in the flow of time. Thus Aron Gurwitsch, on the origins of this inquiry: “Hume expressly likens consciousness to a theater, but it is, so to speak, a theater without a stage. 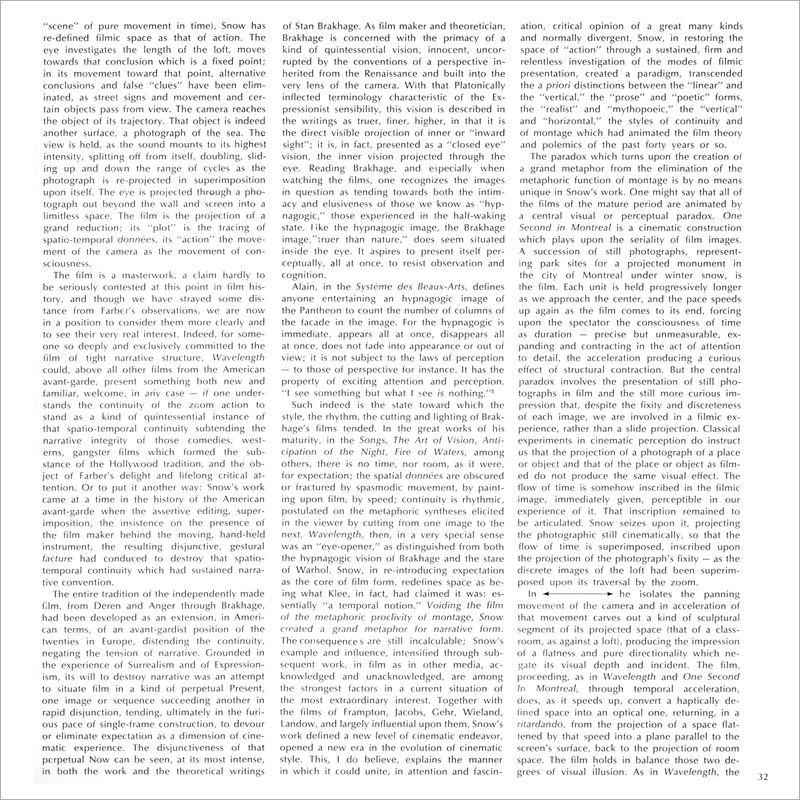 In modern terminology one could compare consciousness with a perpetual succession of kinematographic pictures a unidimensional sphere of being, whose fundamental structure consists only and exclusively in temporality.”1 And Gerard Granel, discussing its modern developments: “Phenomenology is an attempt to film, in slow motion, that which has been, owing to the manner in which it is seen in natural speed, not absolutely unseen, but missed, subject to oversight. It attempts, slowly and calmly, to draw closer to that original intensity which is not given in appearance, but from which things and processes do, nevertheless, in turn proceed.”2 Epistemological inquiry and cinematic experience converge, as it were, in reciprocal mimesis. There are, in the history of film, a very few artists whose work, in its radical purity and incisiveness, strikes one as paradigmatic in this respect. Among them is Michael Snow, whose Wavelength, some four years old, is now a celebrated film, a turning point for many in the history of the medium as in the maker’s own development. It was once described in this review by Manny Farber, distinguished for the accuracy of his insights, the vigor of his style and the firmness of his allegiance to the tradition of American action film, as “a pure, tough forty-five minutes that may become The Birth of a Nation in Underground films a straightforward document of a room in which a dozen businesses have lived and gone bankrupt.”3 And indeed, the film does seem to be, among other things, just that which is to say “that” observation strikes one as “just” and accurate — conveying, however, an insight which, in some fifteen successive viewings and considerable reflection on the film, had never at any time occurred to me. I will wish to examine briefly and to account for both the accuracy and the surprise of that remark. But here, to begin with, is Snow’s description of his film, prepared for the 1967 International Experimental Film Festival of Knokke-le-Zoute in which it took first prize. Wavelength was shot in one week Dec. ’66 preceded by a year of notes, shots, mutterings. It was edited and first print seen in May ’67. I wanted to make a summation of my nervous system, religious inklings and esthetic ideas. I was thinking of, planning for, a time monument in which the beauty and sadness of equivalence would be celebrated, thinking of trying to make a definitive statement of pure film space and time, a balancing of “illusion” and “fact,” all about seeing. The space starts at the camera’s (spectator’s) eye, is in the air, then is on the screen, then is within the screen (the mind). The film is a continuous zoom which takes 45 minutes to go from its widest field to its smallest and final field. It was shot with a fixed camera from one end of an 80 foot loft, shooting the other end, a row of windows and the street. This, the setting and the action which takes place there are cosmically equivalent. The room (and the zoom) are interrupted by 4 human events including a death. The sound on these occasions is sync sound, music and speech, occurring simultaneously with an electronic sound, a sine wave, which goes from its lowest (50 cycles per second) note to its highest (12000 c.p.s.) in 40 minutes. It is a total glissando and a dispersed spectrum which attempts to utilize the gifts of both prophecy and memory which only film and music have to offer. Among details one would want to add to that description would be the quality of the “human events,” their somewhat scattered, random aspect. They take place abruptly, are discrete with respect to one another, are played in a range which runs from the strongly distanced and flat to the conventionally mimetic, linked in some suggestion of causality by only a few lines of dialogue. Secondly, there is the occurrence, through the film, of color flashes in a range of extraordinary intensity, of sudden changes of the field from positive to negative, of superimposition of fixed images over the progressive zoom, itself by no means absolutely steady, but proceeding in a slight visible stammer. 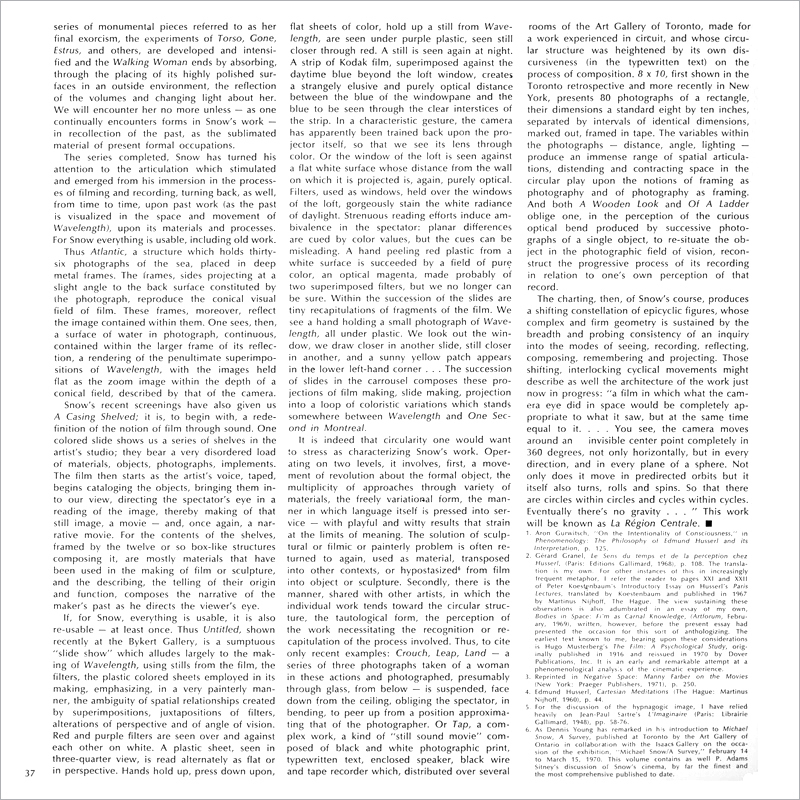 The superimpositions and stammer function as a sort of visual obbligato, as does the evidence of splice marks, the use of varying film stocks, creating within the movement forward, a succession of fixed or still moments. Then there is the precise nature of the visual field in focus: it is, as we have said, the far end of a loft, opening through windows onto a street whose signs, sounds, traffic and traffic lights are perceptible to us beyond the tall, rectangular windows which are each in turn composed of eight small rectangular panes. The perception of wall, of window, of street will be modified in clarity by color, by superimposition, as the crescendo of the sine wave will modify our perception of the sound within and beyond the loft. The camera’s movement is, of course, beginning to slowly reduce and re-define the visual field, and as we ever so slowly move closer to the wall, we begin to perceive — or rather to sense two things: first, the presence of some other, rectangular objects on the central panel of the wall (they are as yet only perceptible as small rectangular surfaces) and then, as well (though the temporal threshold of this perception will vary with the viewer), the destination of the camera. Or rather, we sense the fact that it has a destination, that its movement will terminate inexorably in a focusing upon a particular area not yet known to us. The camera, in the movement of its zoom, installs within the viewer a threshold of tension, of expectation; within one the feeling forms that this area will be coincident with a given section of the wall, with a pane of the window, or perhaps—in fact, most probably—with one of the rectangular surfaces punctuating the wall’s central panel and which seems at this distance to bear images, as yet undecipherable. Now the effect of these perceptions is to present the movement forward as a flow which bears in its wake, contains, discrete events: their discreteness articulates an allusion to the separate frames out of which persistence of vision organizes cinematic illusion. Above all, however, they create, through the slow focusing in time, through relentless directionality, that regard for the future which forms an horizon of expectation. We are proceeding from uncertainty to certainty, as our camera narrows its field, arousing and then resolving our tension of puzzlement as to its ultimate destination, describing, in the splendid purity of its one, slow movement, the notion of the “horizon” characteristic of every subjective process and fundamental as a trait of intentionality. That steady movement forward, with its superimposition, its events passing into the field from behind the camera and back again beyond it, figures the view that “to every perception there always belongs a horizon of the past, as a potentiality of recollections that can be awakened; and to every recollection there belongs as an horizon, the continuous intervening intentionality of possible recollections (to be actualized on my initiative, actively), up to the actual Now of perception.”4 And as the camera continues to move steadily forward, building a tension that grows in direct ratio to the reduction of the field, we recognize, with some surprise, those horizons as defining the contours of narrative, of that narrative form animated by distended temporality, turning upon cognition, towards revelation. Waiting for an issue, we are “suspended” towards resolution. And it is as if by emptying the space of his film (dramatically, through extreme distancing, visually by presenting it as mere volume, the“scene” of pure movement in time), Snow has re-defined filmic space as that of action. The eye investigates the length of the loft, moves towards that conclusion which is a fixed point; in its movement toward that point, alternative conclusions and false “clues” have been eliminated, as street signs and movement and certain objects pass from view. The camera reaches the object of its trajectory. That object is indeed another surface, a photograph of the sea. The view is held, as the sound mounts to its highest intensity, splitting off from itself, doubling, sliding up and down the range of cycles as the photograph is re-projected in superimposition upon itself. The eye is projected through a photograph out beyond the wall and screen into a limitless space. The film is the projection of a grand reduction; its “plot” is the tracing of spatio-temporal données, its “action” the movement of the camera as the movement of consciousness. The film is a masterwork, a claim hardly to he seriously contested at this point in film history, and though we have strayed some distance from Farber’s observations, we are now in a position to consider them more clearly and to see their very real interest. Indeed, for someone so deeply and exclusively committed to the film of tight narrative structure, Wavelength could, above all other films from the American avant-garde, present something both new and familiar, welcome, in any case—if one understands the continuity of the zoom action to stand as a kind of quintessential instance of that spatio-temporal continuity subtending the narrative integrity of those comedies, westerns, gangster films which formed the substance of the Hollywood tradition, and the object of Farber’s delight and lifelong critical attention. Or to put it another way: Snow’s work came at a time in the history of the American avant-garde when the assertive editing, superimposition, the insistence on the presence of the film maker behind the moving, hand-held instrument, the resulting disjunctive, gestural facture had conduced to destroy that spatio-temporal continuity which had sustained narrative convention. The entire tradition of the independently made film, from Deren and Anger through Brakhage, had been developed as an extension, in American terms, of an avant-gardist position of the twenties in Europe, distending the continuity, negating the tension of narrative. Grounded in the experience of Surrealism and of Expressionism, its will to destroy narrative was an attempt to situate film in a kind of perpetual Present, one image or sequence succeeding another in rapid disjunction, tending, ultimately in the furious pace of single-frame construction, to devour or eliminate expectation as a dimension of cinematic experience. The disjunctiveness of that perpetual Now can he seen, at its most intense, in both the work and the theoretical writings of Stan Brakhage. As film maker and theoretician, Brakhage is concerned with the primacy of a kind of quintessential vision, innocent, uncorrupted by the conventions of a perspective inherited from the Renaissance and built into the very lens of the camera. With that Platonically inflected terminology characteristic of the Expressionist sensibility, this vision is described in the writings as truer, finer, higher, in that it is the direct visible projection of inner or “inward sight”; it is, in fact, presented as a “closed eye” vision, the inner vision projected through the eye. Reading Brakhage, and especially when watching the films, one recognizes the images in question as tending towards both the intimacy and elusiveness of those we know as “hypnagogic,” those experienced in the half-waking state. I like the hypnagogic image, the Brakhage image,“truer than nature,” does seem situated inside the eye. It aspires to present itself perceptually, all at once, to resist observation and cognition. Such indeed is the state toward which the style, the rhythm, the cutting and lighting of Brakhage’s films tended. In the great works of his maturity, in the Songs, The Art of Vision, Anticipation of the Night, Fire of Waters, among others, there is no time, nor room, as it were, for expectation; the spatial données are obscured or fractured by spasmodic movement, by painting upon film, by speed; continuity is rhythmic, postulated on the metaphoric syntheses elicited in the viewer by cutting from one image to the next. Wavelength, then, in a very special sense was an “eye-opener,” as distinguished from both the hypnagogic vision of Brakhage and the stare of Warhol. Snow, in re-introducing expectation as the core of film form, redefines space as being what Klee, in fact, had claimed it was: essentially “a temporal notion.” Voiding the film of the metaphoric proclivity of montage, Snow created a grand metaphor for narrative form. The consequence s are still incalculable; Snow’s example and influence, intensified through subsequent work, in film as in other media, acknowledged and unacknowledged, are among the strongest factors in a current situation of the most extraordinary interest. Together with the films of Frampton, Jacobs, Gehr, Wieland, Landow, and largely influential upon them, Snow’s work defined a new level of cinematic endeavor, opened a new era in the evolution of cinematic style. This, I do believe, explains the manner in which it could unite, in attention and fascination, critical opinion of a great many kinds and normally divergent. Snow, in restoring the space of “action” through a sustained, firm and relentless investigation of the modes of filmic presentation, created a paradigm, transcended the a priori distinctions between the “linear” and the “vertical,” the “prose” and “poetic” forms, the “realist” and “mythopoeic,” the “vertical” and “horizontal,” the styles of continuity and of montage which had animated the film theory and polemics of the past forty years or so. 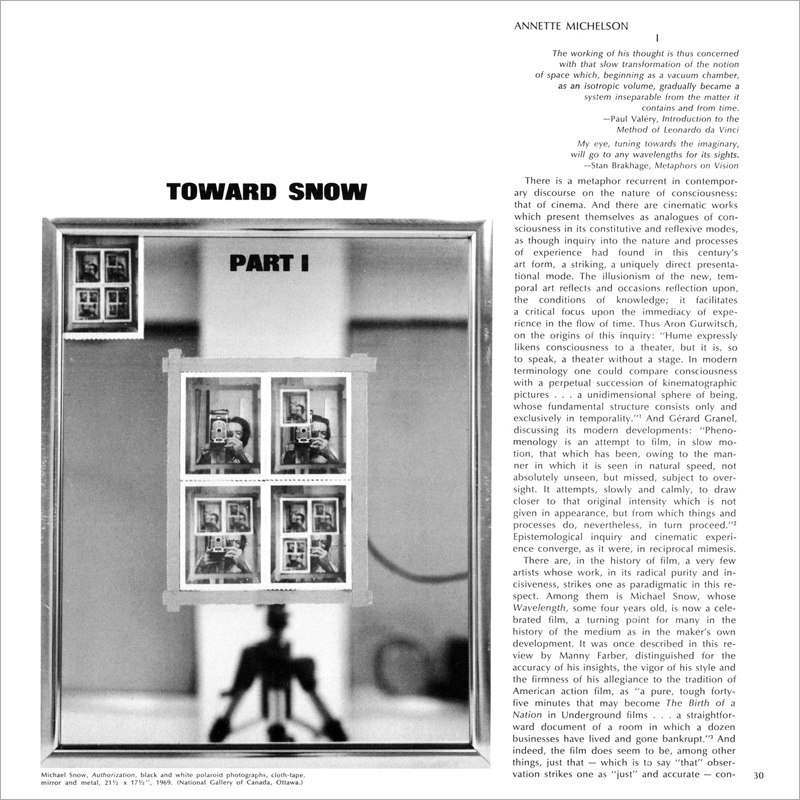 The paradox which turns upon the creation of a grand metaphor from the elimination of the metaphoric function of montage is by no means unique in Snow’s work. One might say that all of the films of the mature period are animated by a central visual or perceptual paradox. One Second in Montreal is a cinematic construction which plays upon the seriality of film images. A succession of still photographs, representing park sites for a projected monument in the city of Montreal under winter snow, is the film. Each unit is held progressively longer as we approach the center, and the pace speeds up again as the film comes to its end, forcing upon the spectator the consciousness of time as duration—precise but unmeasurable, expanding and contracting in the act of attention to detail, the acceleration producing a curious effect of structural contraction. But the central paradox involves the presentation of still photographs in film and the still more curious impression that, despite the fixity and discreteness of each image, we are involved in a filmic experience, rather than a slide projection. Classical experiments in cinematic perception do instruct us that the projection of a photograph of a place or object and that of the place or object as filmed do not produce the same visual effect. The flow of time is somehow inscribed in the filmic image, immediately given, perceptible in our experience of it. That inscription remained to be articulated. Snow seizes upon it, projecting the photographic still cinematically, so that the flow of time is superimposed, inscribed upon the projection of the photograph’s fixity as the discrete images of the loft had been superimposed upon its traversal by the zoom. he isolates the panning movement of the camera and in acceleration of that movement carves out a kind of sculptural segment of its projected space (that of a classroom, as against a loft), producing the impression of a flatness and pure directionality which negate its visual depth and incident. The film, proceeding, as in Wavelength and One Second In Montreal, through temporal acceleration, does, as it speeds up, convert a haptically defined space into an optical one, returning, in a ritardando, from the projection of a space flattened by that speed into a plane parallel to the screen’s surface, back to the projection of room space. The film holds in balance those two degrees of visual illusion. As in Wavelength, the “human events” (a class in session, a sweeping, a cop peering through a window, men sparring with one another) are, so to speak, contained, as discrete units within the rhythmic structure of the film, at variance with it, and though these events (the passing of a ball back and forth, the sweeping, etc., the appearance of the title sign upon the blackboard) echo the panning movement of the camera, they punctuate rather than structure the action of the film. In general, the effect is one of succumbing to the grip of the moment; compelled to follow it, we are unable to focus, to settle upon a given object or point within the field. The effect, then, is of rhythmic compulsion and relaxation. The notion of limitation is transposed from the gradual reduction of the size of field to the gradual imposition of insistent directionality, intensified by the metronomic click which seems sometimes to lead, sometimes to accompany, the action. In these three filmic works, the artist has seized upon a strategy proper to the medium and carried it to ultimate consequences, exploring its resonances, reinforcing it with parallel strategies, insisting on the isomorphism of part and whole. These strategies, and the persistence of a certain speculative quality in Snow’s art, a preoccupation with the manner in which a statement generates counterstatement, variation and extension can be seen as constant in his evolution as film maker and as painter, sculptor. Two recent occasions enabled one to study that speculative and exploratory bent and the manner in which it generates whole series of works. These are contingent upon an almost total openness to the possibilities of new materials, and on a correlative compositional obsession, a will to mold, shape, stamp the environment about one into some kind of telling shape. 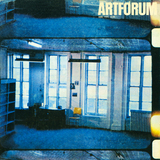 A large and well-mounted retrospective held in February of 1970 at the Art Gallery of Ontario was followed this year by the exhibition of current photographic work at the Bykert Gallery, and this in turn was supplemented with screenings of recent film at the theater of the Anthology Film Archive. The very catalog of the Ontario exhibition, complex and very handsomely designed by the artist, testifies to the manner in which Snow’s total field of vision, range of preoccupations, is pressed into service or admitted to testify in the presentation of present explorations. The family and childhood mythology, as documented and ordered into A Survey, finds its ultimate and playful pendant in the photographic re-statement of the “framing” process in the images of the tray of ice cubes or the Canadian landscape seen through windshield and rear-view mirror. Twoless playful, less casual instances of that coercive theme are the Portrait of 1967 (literally a frame visibly assembled from aluminum elements held by clamps) and, most interestingly, Sight (1967), a remarkable two-sided panel of aluminum and engraved plastic, measuring 56 by 42 inches. Free standing, it contains one aperture, narrow and slanted. One side is incised with squares, some of these divided by parallel lines; the slanted aperture traverses the space between upper right-hand to lower left-hand corner of the square located next to the last at the right-hand edge of the larger square and one-third from the top. The aperture totally absorbs the tiny fraction of wholly extraneous visual material through it; it is all somehow drawn into the total composition of the surface, absorbed into its linear pattern, its accident and irregularity tamed, as it were, to the uses of geometry. Turning around to the other side of the surface, peering through the slot which breaks its even, unarticulated, glistening aluminum surface, punctuated only by occasional bolts, we perceive the total unassimilability of the scene beyond it. Snow’s early work is that of an extremely talented young painter passing quickly from the rhythmic articulation of the figure to very sophisticated strategies of abstraction articulated in a somewhat geometric mode. Lac Clair and The Drumbook, both of 1960, explore the modalities of a figure-ground relationship. In Lac Clair (oil on paper on canvas), the central area is a kind of bleu canard, painted in very free but light strokes, intercepted at each corner by a strip of paper superimposed on the canvas side. It is an altogether simple and elegant work, very much involved with a kind of single-image later to become quite popular in New York in the ’60s. And The Drumbook is a series of rectangles, dark blue upon yellow ground, of slightly varying sizes, setting up discrete and contiguous framing areas which seem, nevertheless, to form a continuous ground. White Trash of that year is a collage of “soiled and folded paper,” managing in its pleated elegance to convert its soiled aspect into subtle color, like that of a worn tennis shoe. There are a number of works in folded paper, pencilled and “expanded” or expansible, which in their modesty, casualness and subtle variety testify to a kind of constant playfulness, later to flower in the major series, implementing metaphors grown central to Snow’s investigations. Concentrating on painting and on film making (Snow had begun in 1956 to work in film), he is obviously preoccupied with spatial variation. Objects such as Shunt (1959) and Quits (1959) explore sculptural form, seek new ways of support, along corner of wall and floor, in leaning position. Quits is rather like a collapsible and deformed ladder, wood painted black, and a trace of blue paint runs down the bottom side of the first four steps and probably on the last, which stands directly on the floor. And when you approach it you see green paint on upper surface of steps, thereby deducing its reversibility. It is a work of somewhat more contemporary feeling for its period than, say, Window of 1962, the very charming mixed media piece, whose constellation of objects (postbox, glass, bottle, etc.) has a kind of fresh and modest sumptuousness and the aspect of a small reliquary. But the central, pivotal series of works, executed during the sixties, is the Walking Woman series, and I shall, in this introductory essay, largely concentrate upon it. They are pursued during a critical time in his development. Accompanying his move from Canada to New York, they constitute one of the largest, most obsessively pursued themes and give rise to a countless series of variations, which are pursued parallel to his major film works. They are also highly controversial, and, I believe, little understood. The basic image of the Walking Woman is a very simple, minimally articulated silhouette, a series of summary curves describing a figure truncated at wrists and ankles. The curves of hair, breast and thighs describe a mesomorph in striding position, tilted slightly, one arm extended forward a bit and the other somewhat further to the rear. The series consists in a vast number of encyclopedic variations upon a given silhouette of simple, almost caricatural contours. Conceived and executed largely during the years of Pop, these works neither offer the polish nor the sensuousness of the work of the major American Pop artists. The irony and sensuousness of media images and plastic materials to be found in Lichtenstein and Warhol are absent from these works. Lushness of surface, intensity of color are also lacking, as are the kinds of irony available in the use of consecrated images—familiar labels, packages and such. The series does, on the other hand, explore in a fashion that parallels the Americans, the possibilities of a single basic figure, of its serial organization or variationalplay effected by change of context. 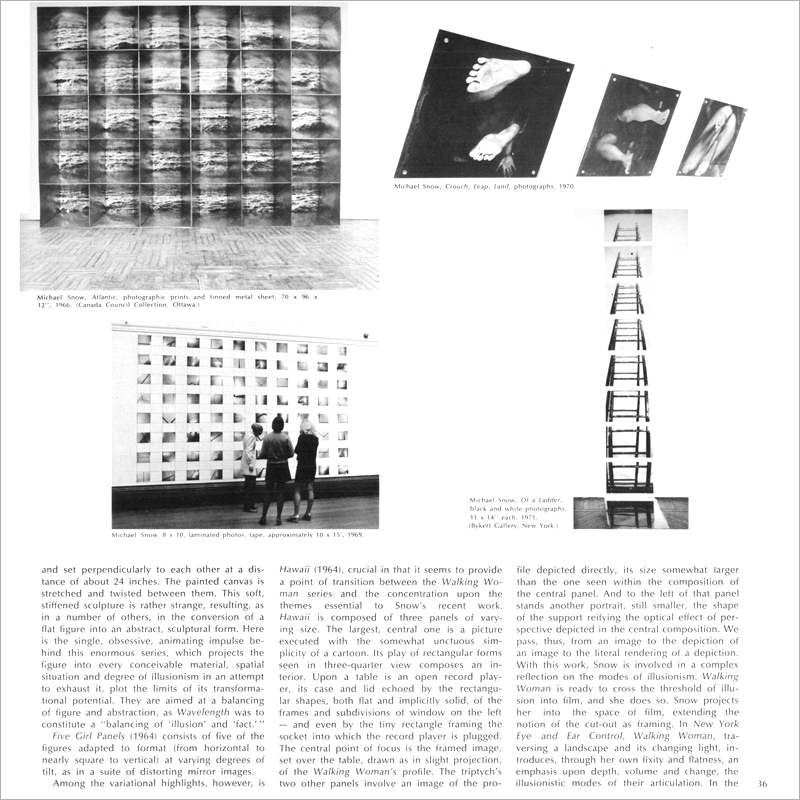 They explore much more radically and extensively, however, the contrast between pictorial and sculptural space, modes and degree of representation and variety of materials. Five Girl Panels (1964) consists of five of the figures adapted to format (from horizontal to nearly square to vertical) at varying degrees of tilt, as in a suite of distorting mirror images. Among the variational highlights, however, is Hawaii (1964), crucial in that it seems to provide a point of transition between the Walking Woman series and the concentration upon the themes essential to Snow’s recent work. Hawaii is composed of three panels of varying size. The largest, central one is a picture executed with the somewhat unctuous simplicity of a cartoon. Its play of rectangular forms seen in three-quarter view composes an interior. Upon a table is an open record player, its case and lid echoed by the rectangular shapes, both flat and implicitly solid, of the frames and subdivisions of window on the left—and even by the tiny rectangle framing the socket into which the record player is plugged. The central point of focus is the framed image, set over the table, drawn as in slight projection, of the Walking Woman’s profile. The triptych’s two other panels involve an image of the profile depicted directly, its size somewhat larger than the one seen within the composition of the central panel. And to the left of that panel stands another portrait, still smaller, the shape of the support reifying the optical effect of perspective depicted in the central composition. We pass, thus, from an image to the depiction of an image to the literal rendering of a depiction. With this work, Snow is involved in a complex reflection on the modes of illusionism. Walking Woman is ready to cross the threshold of illusion into film, and she does so. Snow projects her into the space of film, extending the notion of the cut-out as framing. In New York Eye and Ear Control, Walking Woman, traversing a landscape and its changing light, introduces, through her own fixity and flatness, an emphasis upon depth, volume and change, the illusionistic modes of their articulation. In the series of monumental pieces referred to as her final exorcism, the experiments of Torso, Gone, Estrus, and others, are developed and intensified and the Walking Woman ends by absorbing, through the placing of its highly polished surfaces in an outside environment, the reflection of the volumes and changing light about her. We will encounter her no more unless—as one continually encounters forms in Snow’s work—in recollection of the past, as the sublimated material of present formal occupations. The series completed, Snow has turned his attention to the articulation which stimulated and emerged from his immersion in the processes of filming and recording, turning back, as well, from time to time, upon past work (as the past is visualized in the space and movement of Wavelength), upon its materials and processes. For Snow everything is usable, including old work. Thus Atlantic, a structure which holds thirty-six photographs of the sea, placed in deep metal frames. The frames, sides projecting at a slight angle to the back surface constituted by the photograph, reproduce the conical visual field of film. These frames, moreover, reflect the image contained within them. 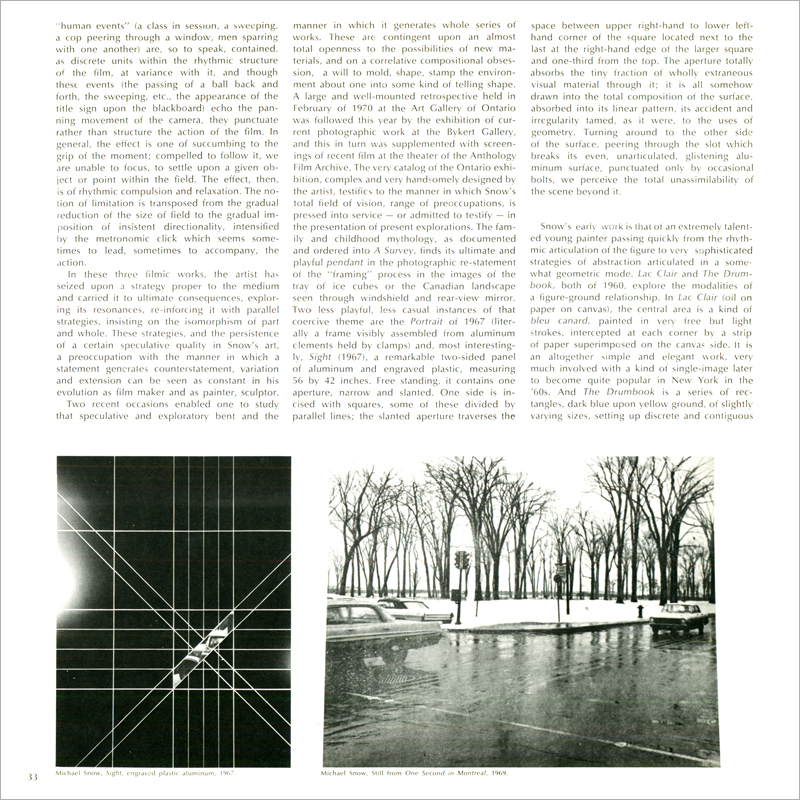 One sees, then, a surface of water in photograph, continuous, contained within the larger frame of its reflection, a rendering of the penultimate superimpositions of Wavelength, with the images held flat as the zoom image within the depth of a conical field, described by that of the camera. Snow’s recent screenings have also given us A Casing Shelved; it is, to begin with, a redefinition of the notion of film through sound. One colored slide shows us a series of shelves in the artist’s studio; they bear a very disordered load of materials, objects, photographs, implements. The film then starts as the artist’s voice, taped, begins cataloging the objects, bringing them into our view, directing the spectator’s eye in a reading of the image, thereby making of that still image, a movie and, once again, a narrative movie. For the contents of the shelves, framed by the twelve or so box-like structures composing it, are mostly materials that have been used in the making of film or sculpture, and the describing, the telling of their origin and function, composes the narrative of the maker’s past as he directs the viewer’s eye. If, for Snow, everything is usable, it is also re-usable—at least once. Thus Untitled, shown recently at the Bykert Gallery, is a sumptuous “slide show” which alludes largely to the making of Wavelength, using stills from the film, the filters, the plastic colored sheets employed in its making, emphasizing, in a very painterly manner, the ambiguity of spatial relationships created by superimpositions, juxtapositions of filters, alterations of perspective and of angle of vision. Red and purple filters are seen over and against each other on white. A plastic sheet, seen in three quarter view, is read alternately as flat or in perspective. Hands hold up, press down upon, flat sheets of color, hold up a still from Wavelength, are seen under purple plastic, seen still closer through red. A still is seen again at night. A strip of Kodak film, superimposed against the daytime blue beyond the loft window, creates a strangely elusive and purely optical distance between the blue of the windowpane and the blue to be seen through the clear interstices of the strip. In a characteristic gesture, the camera has apparently been trained back upon the projector itself, so that we see its lens through color. Or the window of the loft is seen against a flat white surface whose distance from the wall on which it is projected is, again, purely optical. Filters, used as windows, held over the windows of the loft, gorgeously stain the white radiance of daylight. Strenuous reading efforts induce ambivalence in the spectator: planar differences are cued by color values, but the cues can be misleading. A hand peeling red plastic from a white surface is succeeded by a field of pure color, an optical magenta, made probably of two superimposed filters, but we no longer can be sure. Within the succession of the slides are tiny recapitulations of fragments of the film. We see a hand holding a small photograph of Wavelength, all under plastic. We look out the window, we draw closer in another slide, still closer in another, and a sunny yellow patch appears in the lower left-hand corner The succession of slides in the carrousel composes these projections of film making, slide making, projection into a loop of coloristic variations which stands somewhere between Wavelength and One Second in Montreal. It is indeed that circularity one would want to stress as characterizing Snow’s work. Operating on two levels, it involves, first, a movement of revolution about the formal object, the multiplicity of approaches through variety of materials, the freely variational form, the manner in which language itself is pressed into service—with playful and witty results that strain at the limits of meaning. The solution of sculptural or filmic or painterly problem is often returned to again, used as material, transposed into other contexts, or hypostasized6 from film into object or sculpture. Secondly, there is the manner, shared with other artists, in which the individual work tends toward the circular structure, the tautological form, the perception of the work necessitating the recognition or recapitulation of the process involved. Thus, to cite only recent examples: Crouch, Leap, Land—a series of three photographs taken of a woman in these actions and photographed, presumably through glass, from below—is suspended, face down from the ceiling, obliging the spectator, in bending, to peer up from a position approximating that of the photographer. Or Tap, a complex work, a kind of “still sound movie” composed of black and white photographic print, typewritten text, enclosed speaker, black wire and tape recorder which, distributed over several rooms of the Art Gallery of Toronto, made for a work experienced in circuit, and whose circular structure was heightened by its own discursiveness (in the typewritten text) on the process of composition. 8 x 10, first shown in the Toronto retrospective and more recently in New York, presents 80 photographs of a rectangle, their dimensions a standard eight by ten inches, separated by intervals of identical dimensions, marked out, framed in tape. The variables within the photographs—distance, angle, lighting—produce an immense range of spatial articulations, distending and contracting space in the circular play upon the notions of framing as photography and of photography as framing. 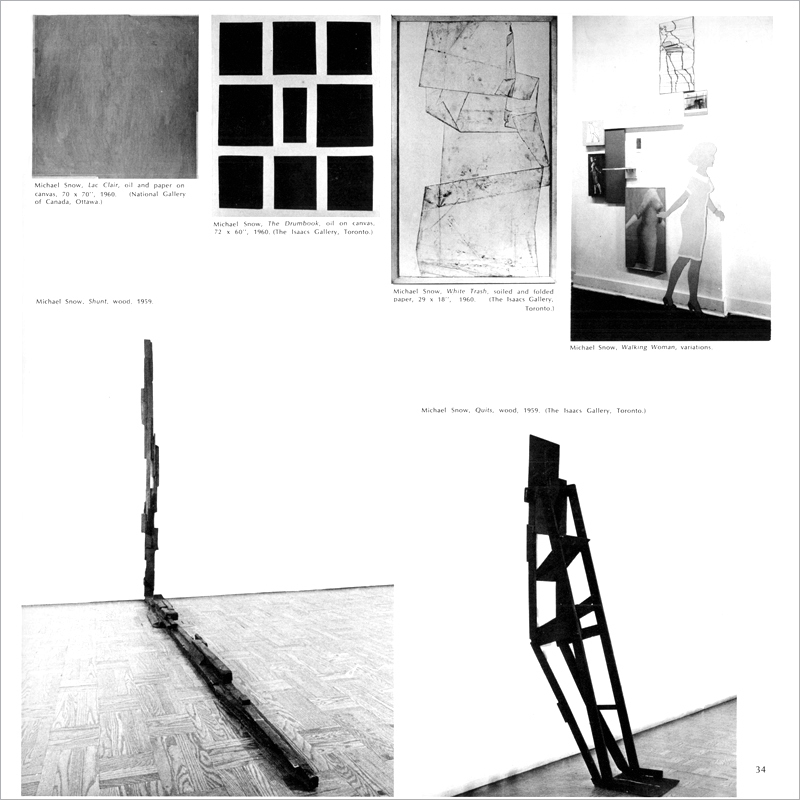 And both A Wooden Look and Of A Ladder oblige one, in the perception of the curious optical bend produced by successive photographs of a single object, to re-situate the object in the photographic field of vision, reconstruct the progressive process of its recording in relation to one’s own perception of that record. The charting, then, of Snow’s course, produces a shifting constellation of epicyclic figures, whose complex and firm geometry is sustained by the breadth and probing consistency of an inquiry into the modes of seeing, recording, reflecting, composing, remembering and projecting. Those shifting, interlocking cyclical movements might describe as well the architecture of the work just now in progress: “a film in which what the camera eye did in space would be completely appropriate to what it saw, but at the same time equal to it. You see, the camera moves around an invisible center point completely in 360 degrees, not only horizontally, but in every direction, and in every plane of a sphere. Not only does it move in predirected orbits but it itself also turns, rolls and spins. So that there are circles within circles and cycles within cycles. Eventually there’s no gravity . . . ” This work will be known as La Région Centrale. 1. Aron Gurwitsch, “On the Intentionality of Consciousness,” in Phenomenology: The Philosophy of Edmund Husserl and its Interpretation, p. 125. 2. Gerard Granel, Le Sens du temps et de la perception chez Husserl, (Paris: Editions Gallimard, 1968), p. 108. The translation is my own. For other instances of this in increasingly frequent metaphor, I refer the reader to pages XXI and XXII of Peter Koestenbaum’s Introductory Essay on Husserl’s Paris Lectures, translated by Koestenbaum and published in 1967 by Martinus Nijhoff, The Hague. 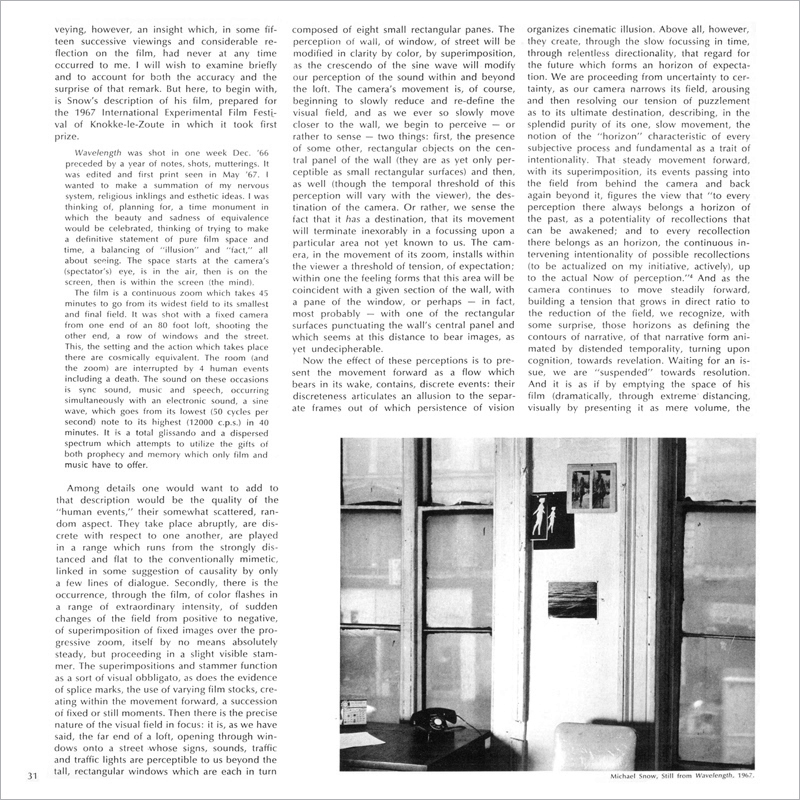 The view sustaining these observations is also adumbrated in an essay of my own, Bodies in Space: Film as Carnal Knowledge, (Artforum, February, 1969), written, however, before the present essay had presented the occasion for this sort of anthologizing. The earliest text known to me, bearing upon these considerations is Hugo Musterberg’s The Film: A Psychological Study, originally published in 1916 and reissued in 1970 by Dover Publications, Inc. It is an early and remarkable attempt at a phenomenological analysts of the cinematic experience. 3. Reprinted in Negative Space: Manny Farber on the Movies (New York: Praeger Publishers, 1971), p. 250. 4. Edmund Husserl, Cartesian Meditations (The Hague: Martinus Nijhoff, 1960), p. 44. 5. For the discussion of the hypnagogic image, I have relied heavily on Jean-Paul Sartre’s L’Imaginaire (Paris: Librairie Gallimard, 1948), pp. 58-76. 6. 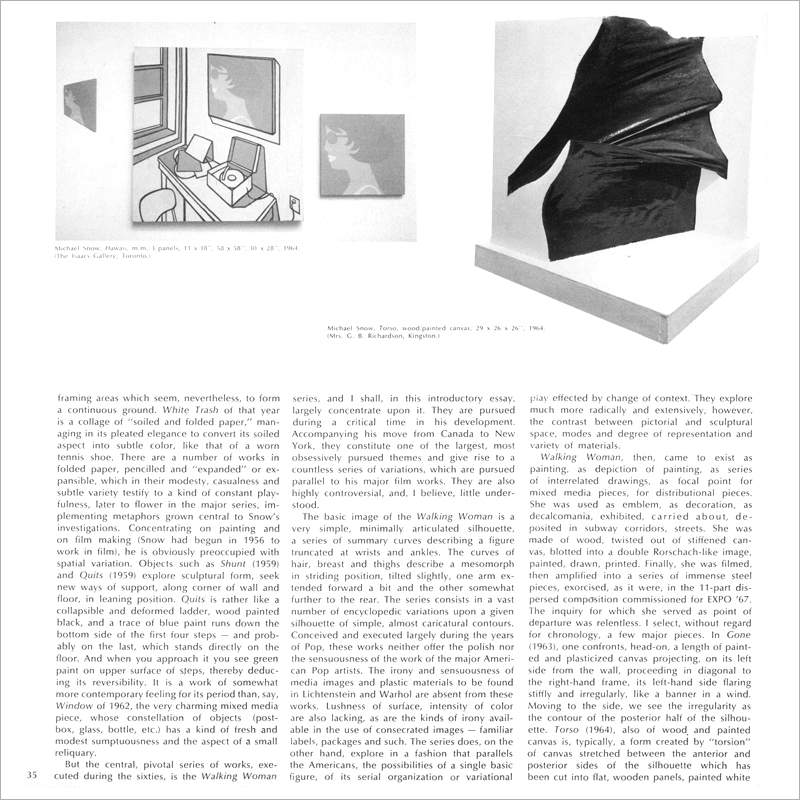 As Dennis Young has remarked in his introduction to Michael Snow, A Survey, published at Toronto by the Art Gallery of Ontario in collaboration with the Isaacs Gallery on the occasion of the exhibition, “Michael Snow/A Survey,” February 14 to March 15, 1970. This volume contains as well P. Adams Sitney’s discussion of Snow’s cinema, by far the finest and the most comprehensive published to date.